Martin Lawrence Galleries (MLG) discovered the glory of Rene Lalonde at the New York Art Expo nearly 20 years ago and has been exclusively showcasing his work ever since. Blending the traditions of surrealism, cubism, and Fauvism, Lalonde grabs viewers with both the emotional force of vivid and unusual color and the simplicity of flattened out planes. Also, along the way, it charges everyday life with extraordinary intensity. Lalonde’s work inspires joy and elicits smiles. Lalonde is an artist who works with the vibrancy and excitement of color, yet somehow projects a sense of calm, serenity-an easygoing buoyancy-in his work. His use of house imagery intentionally conjures up coziness, warmth and the security we are all searching for in life. According to Lalonde, without experimentation, there is no progress. Lalonde is a risk taker – an artistic force unphased by norms of society and born out of a culture and period of rebellion. There is indescribable magic that occurs when you glance upon one of his paintings – his boldness in combining paradoxical styles and influences should fail, but it succeeds to an extraordinary degree. The saying goes that opposites attract, but here they join forces to create a unique new experience for the viewer which is unmatched by the artist’s contemporaries. Lalonde’s gift is to make the complex accessible. He lives and works without fear, and his experimentation is the key to his genius. Rene Lalonde was born into a working-class Montreal family and bought his first serious sets of paints, brushes, and canvases at age 12. As the 1960s unfolded, Lalonde was swept up in the excitement of rock and roll, the Beatles and the artistic movements that helped spawn the psychedelic revolution. 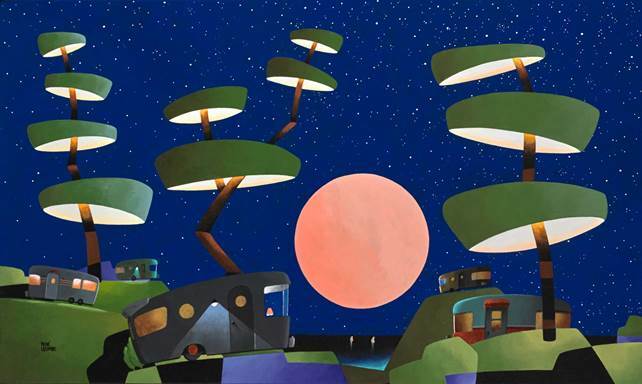 His works “Futurama Trailor Park by the Sea” and “Comfy Bird House” are influenced by his fauvist approach with color values and characteristics that are precise and descriptive. He attended the L’Ecole du Musée des Beaux-Arts de Montréal-a school attached to The Montréal Museum of Fine Arts-and discovered the Cubism of Picasso and the color and infused light of Parrish and Chagall. To date, his career includes over 175 solo exhibits worldwide. Come join Martin Lawrence Galleries for an exceptional exhibition by contemporary artist René Lalonde showcasing fascinating new original works on canvas and meet this “freeform art rebel” of Cubism and Surrealism. Since 1975, Martin Lawrence Galleries (MLG), headquartered in Greenwich, Connecticut with nine galleries nationwide including New York, Chicago, Dallas, Las Vegas, New Orleans, San Francisco, Costa Mesa, La Jolla, Maui, and online atmartinlawrence.com, has assisted and advised collectors in acquiring fine art. (MLG), with its unparalleled collection of treasures, specializes in unique paintings and limited-edition graphics and sculpture by Warhol, Haring, Murakami, Chagall, Picasso, and Erté. Over the last 15 years, it has lent nearly 250 artworks by 16 different artists to 32 museums around the world, and proudly publishes works by artists including Kondakova, Hallam, Bertho, Fressinier, Lalonde and Deyber. For more information visit www.martinlawrence.com. Contact Katia Graytok:203.989.2073. kgraytok@martinlawrence.com. NOTE: High-resolution images of all artist works represented by Martin Lawrence Galleries are available upon request.